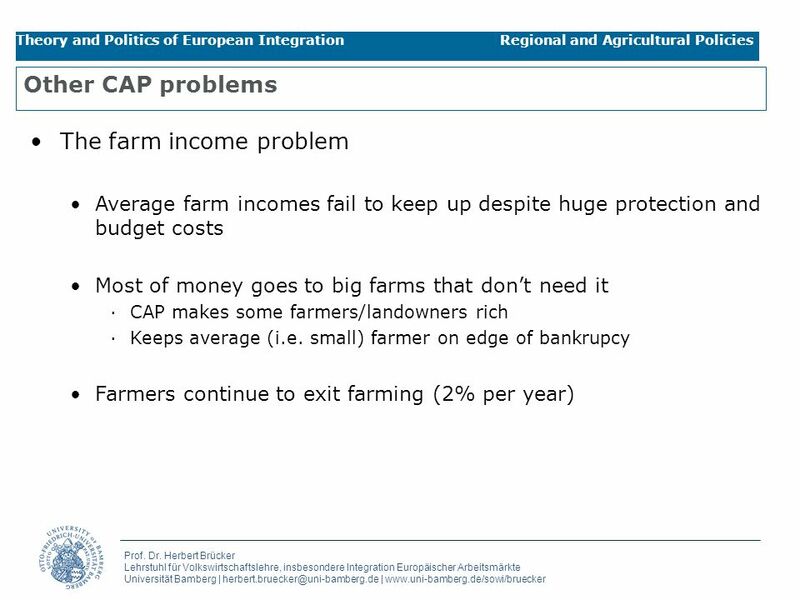 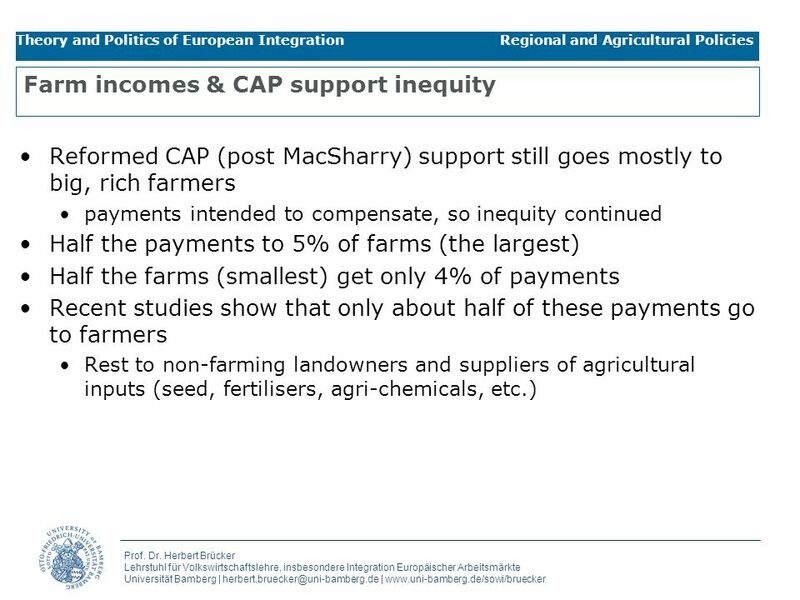 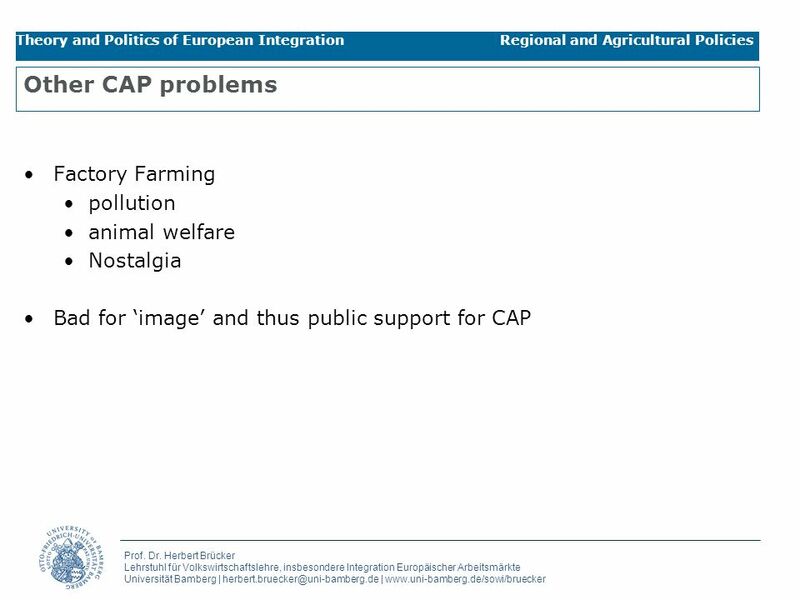 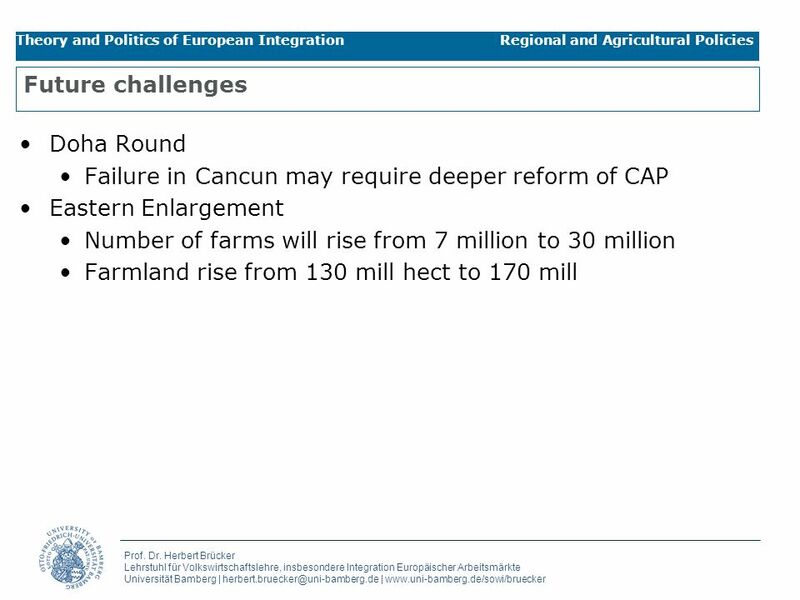 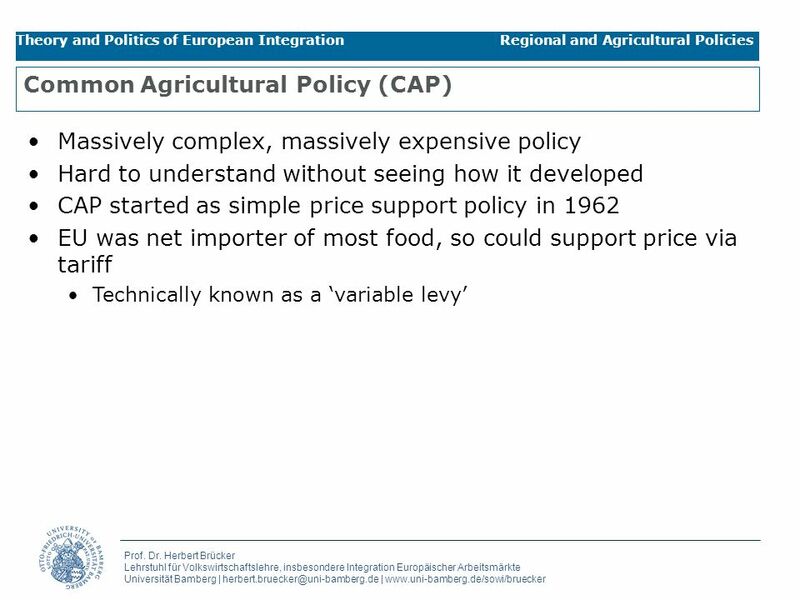 Theorie und Politik der Europäischen Integration Prof. Dr. Herbert Brücker Lecture 10 Regional and Agricultural Policies Theory and Politics of Eropean. 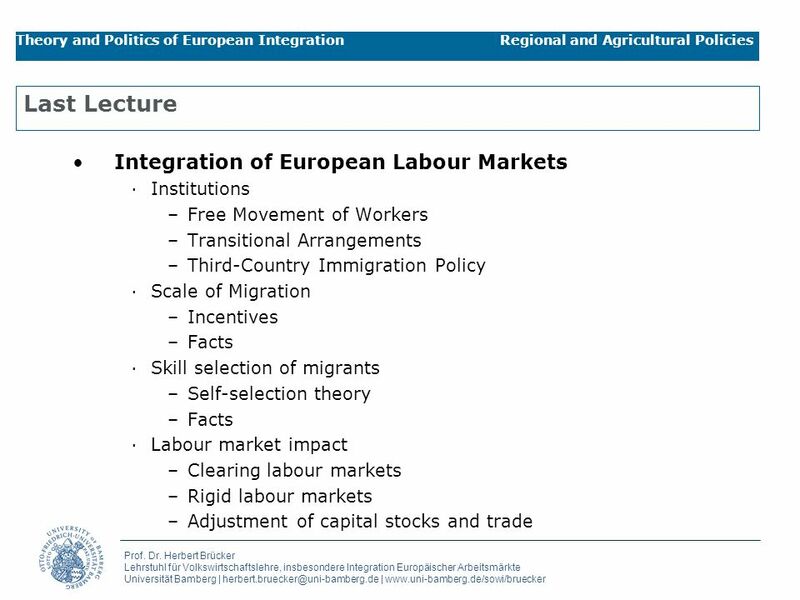 30 Prof. Dr. Herbert Brücker Lehrstuhl für Volkswirtschaftslehre, insbesondere Integration Europäischer Arbeitsmärkte Universität Bamberg | herbert.bruecker@uni-bamberg.de | www.uni-bamberg.de/sowi/bruecker Theory and Politics of European Integration Regional and Agricultural Policies 3 Objectives Objective 1 (about 70% of structural spending). 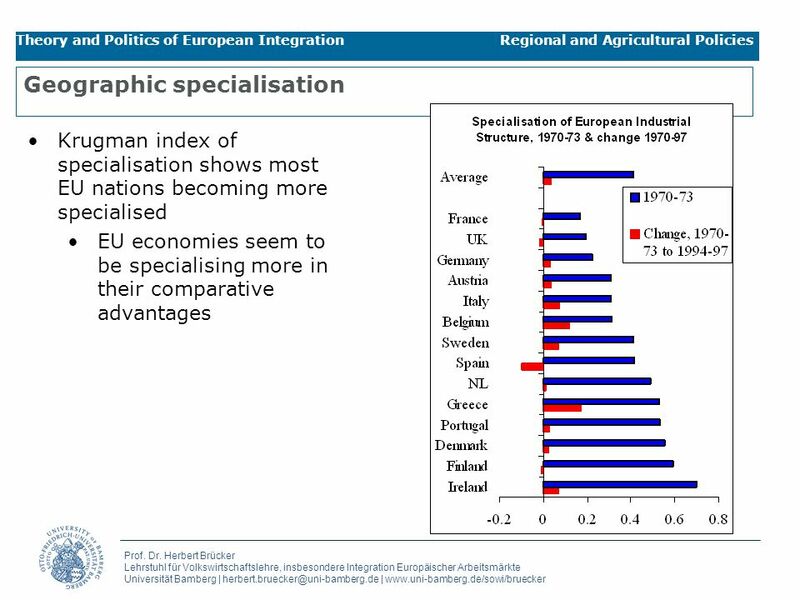 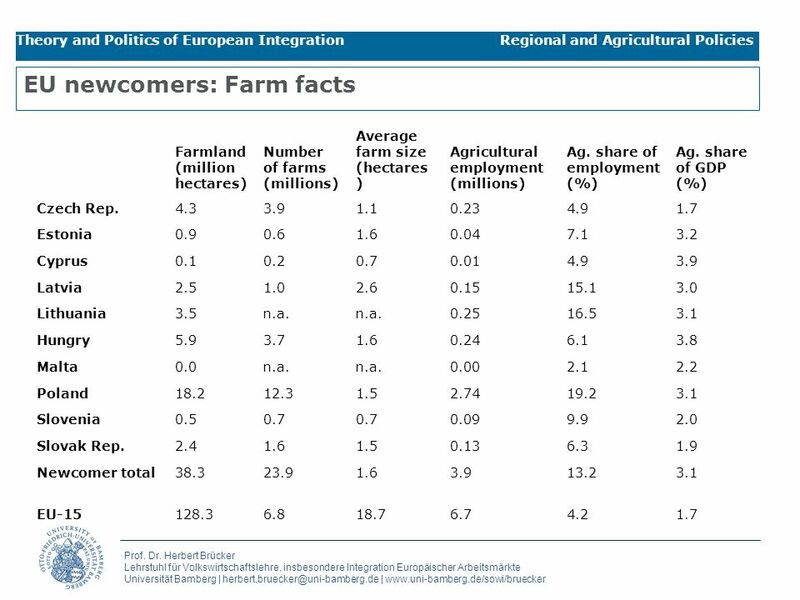 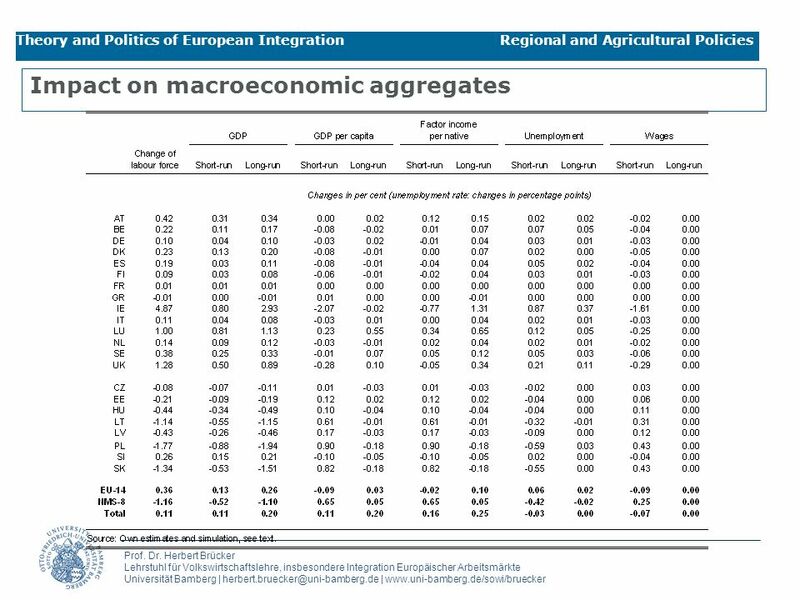 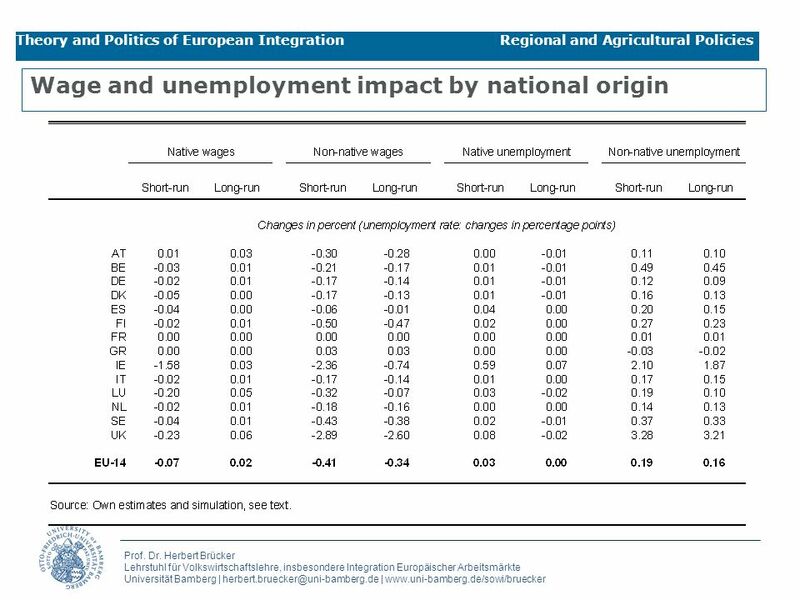 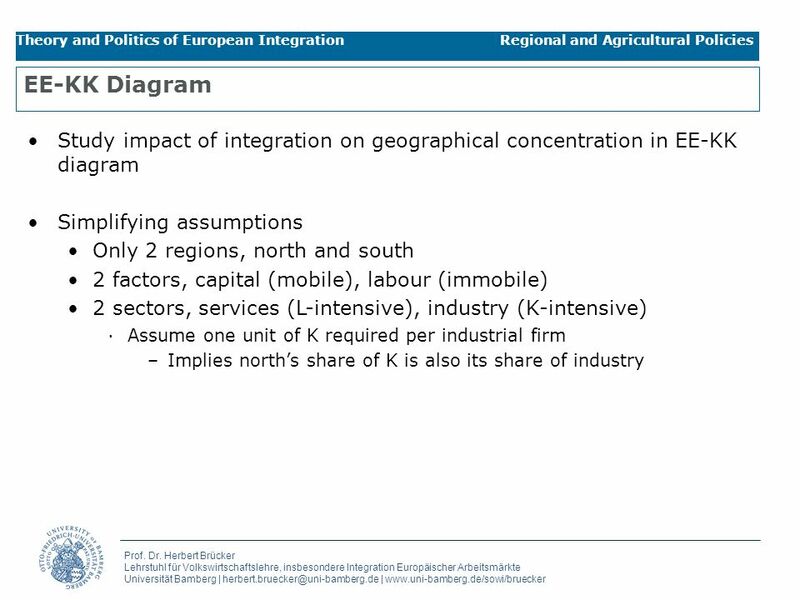 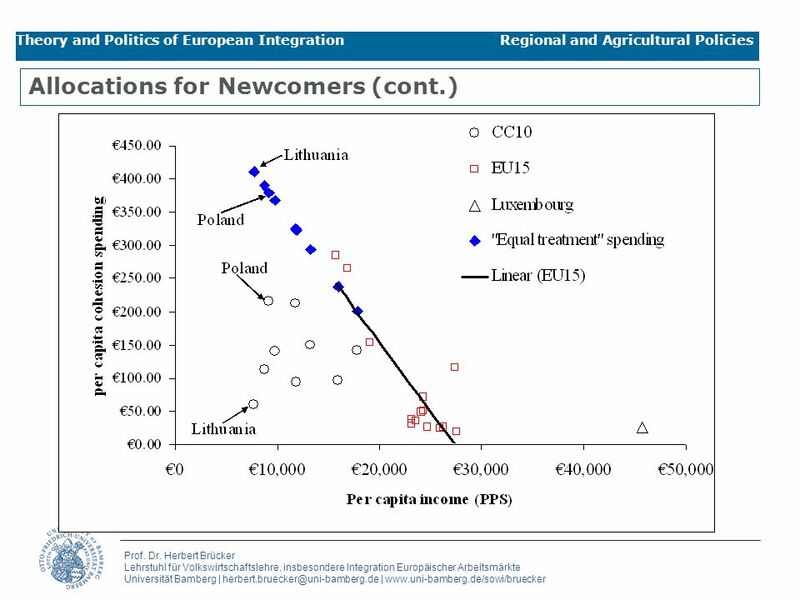 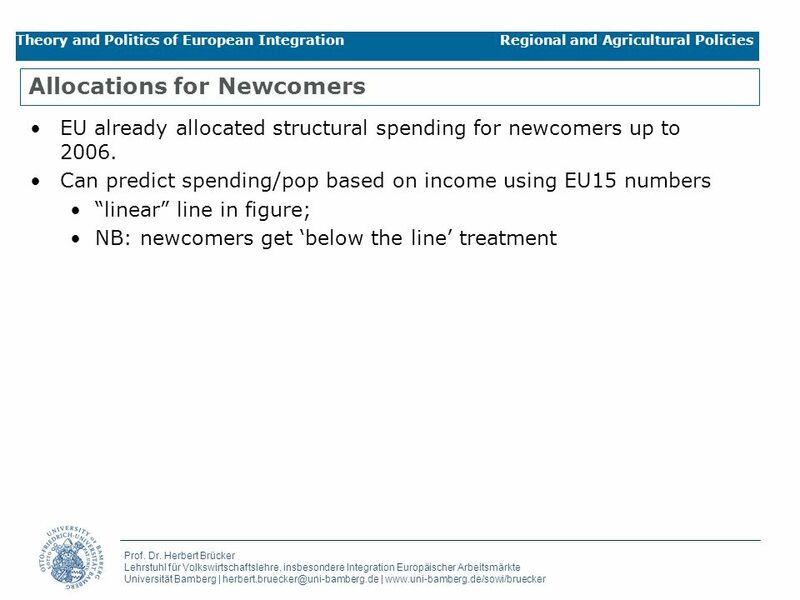 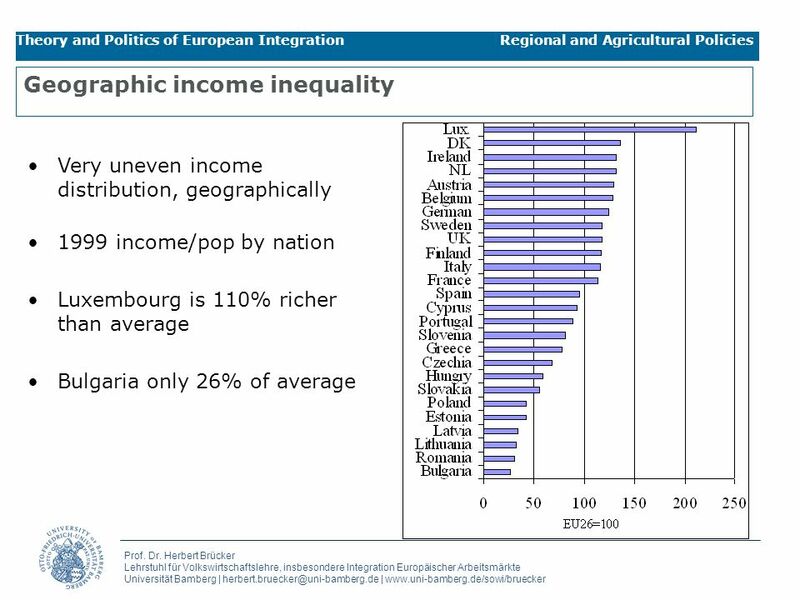 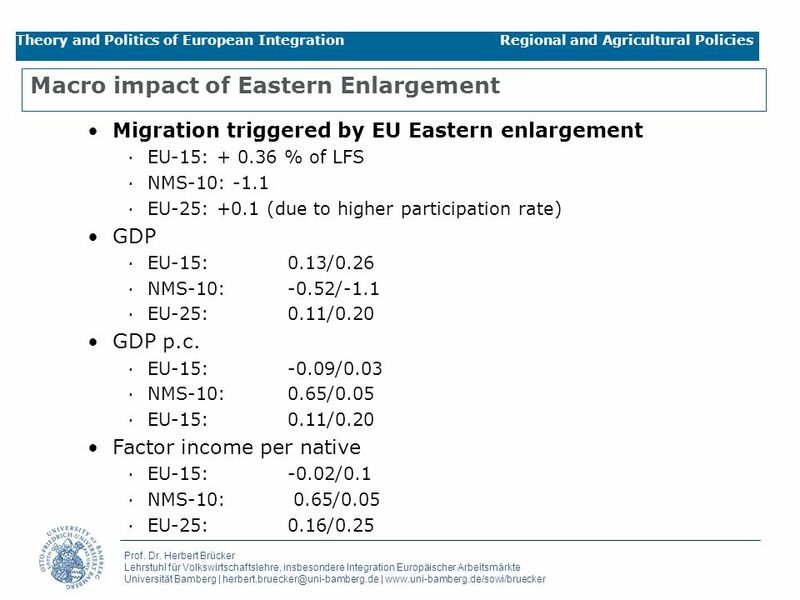 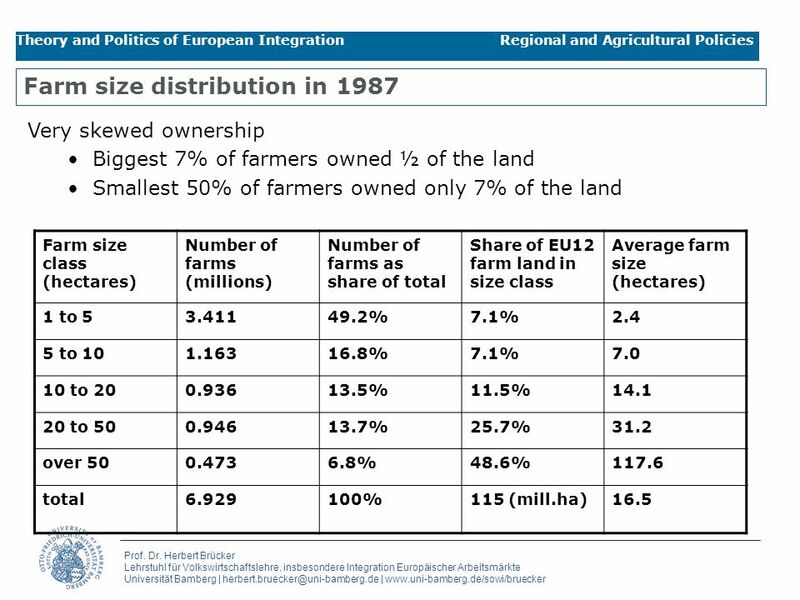 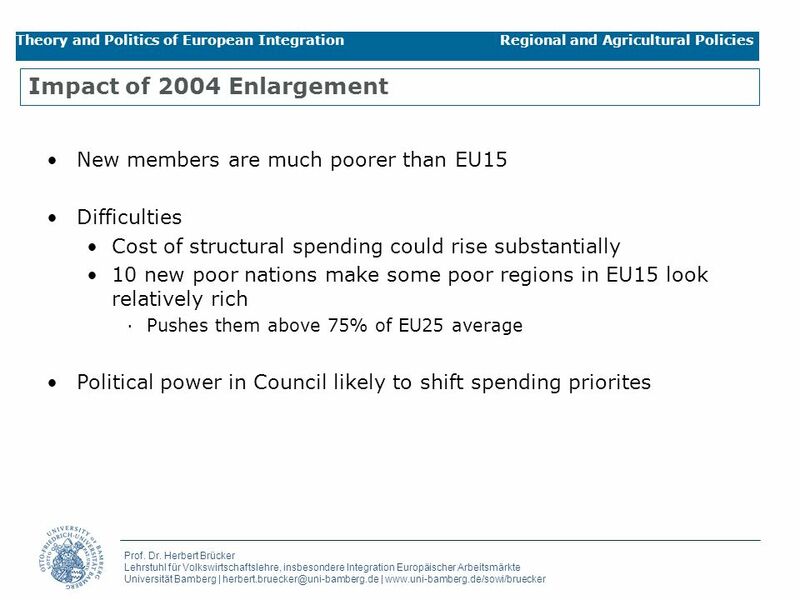 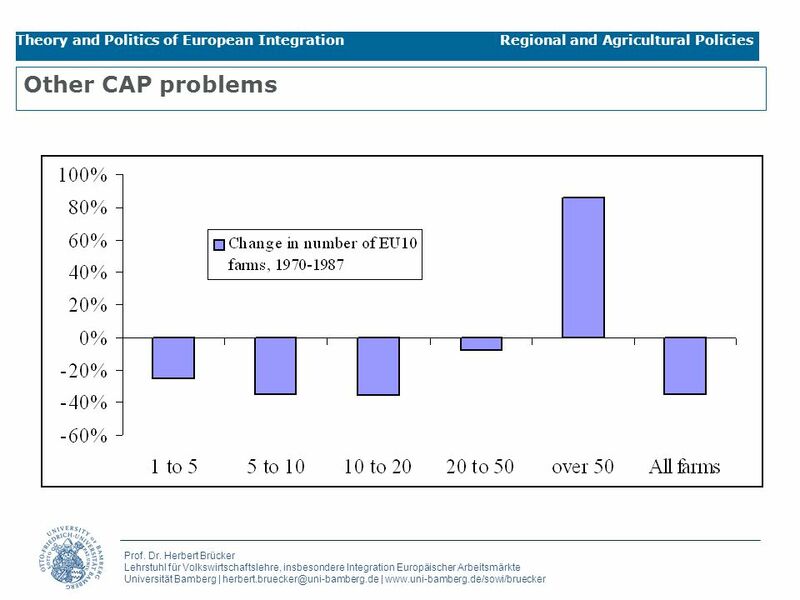 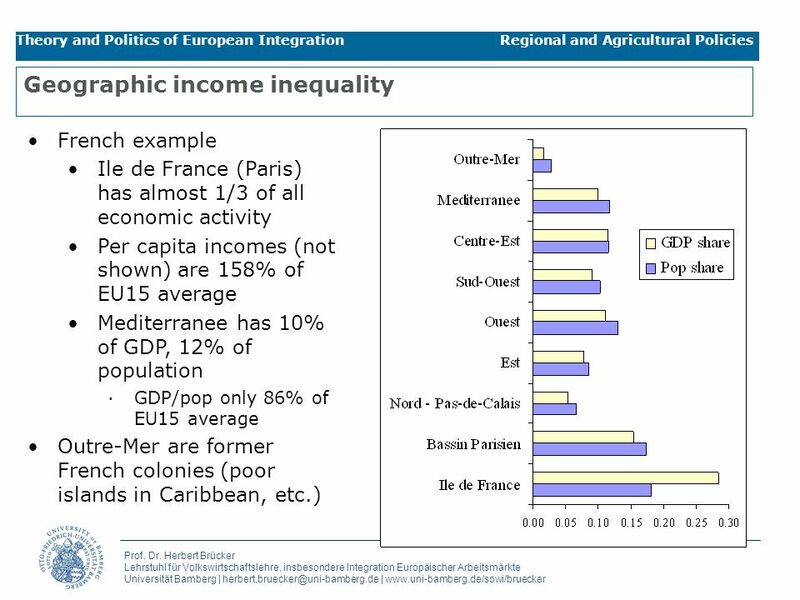 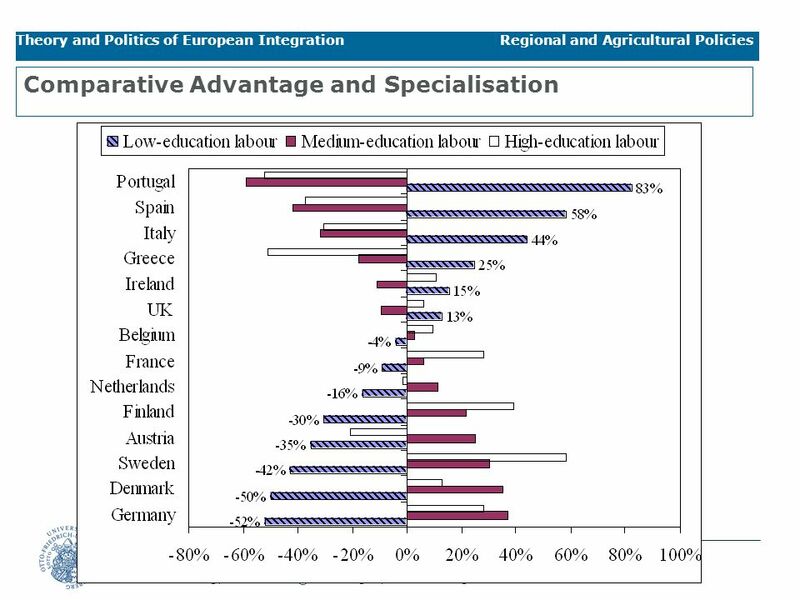 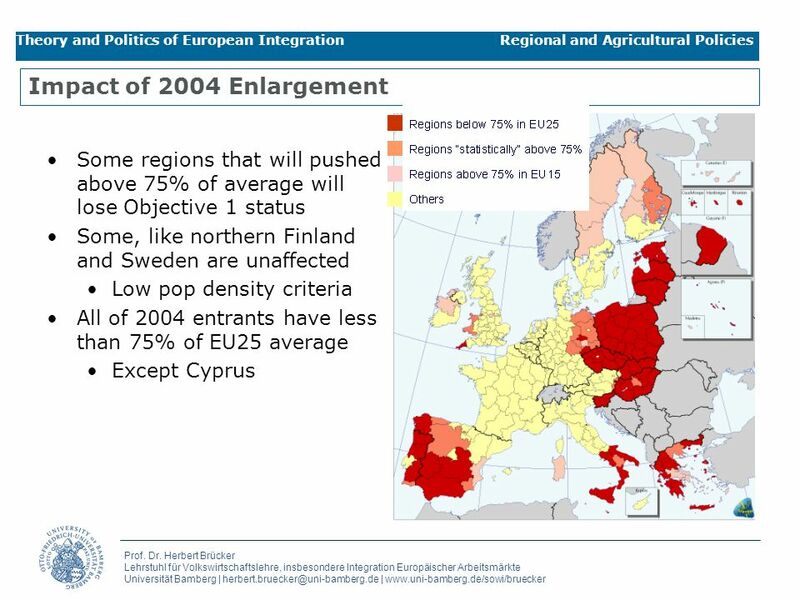 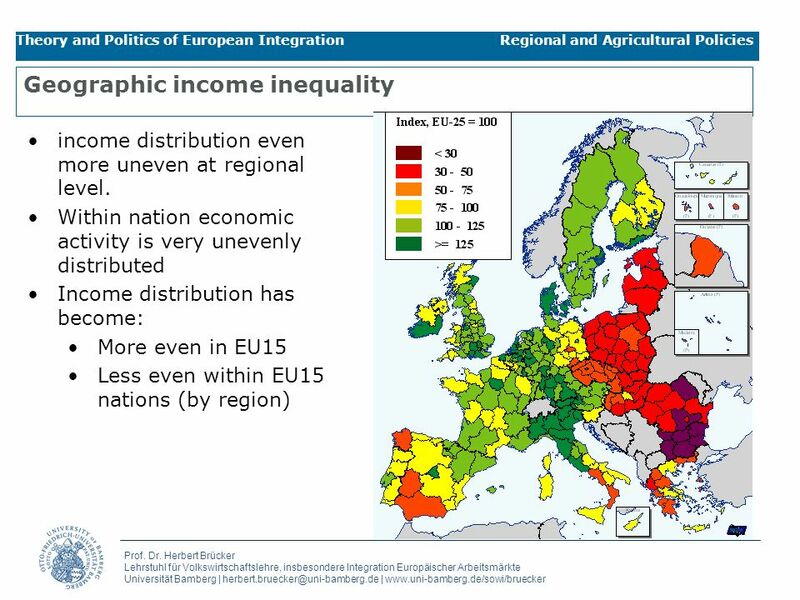 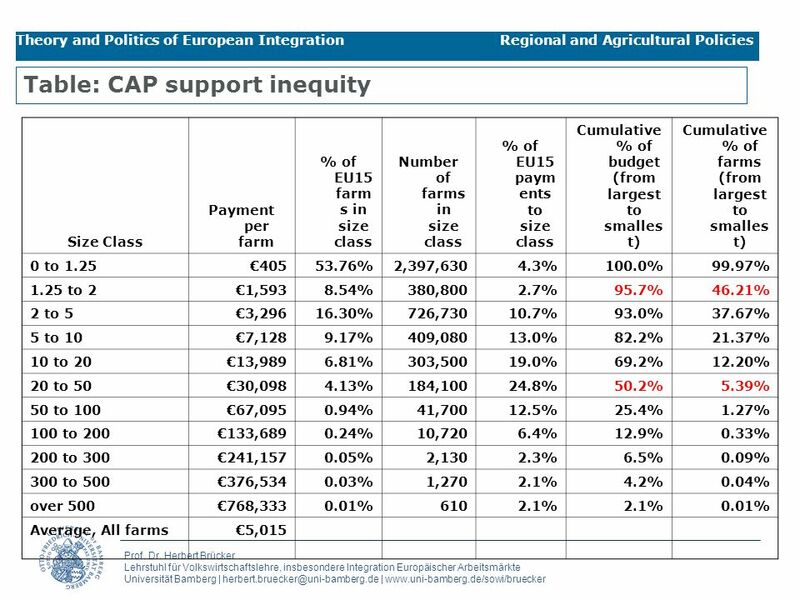 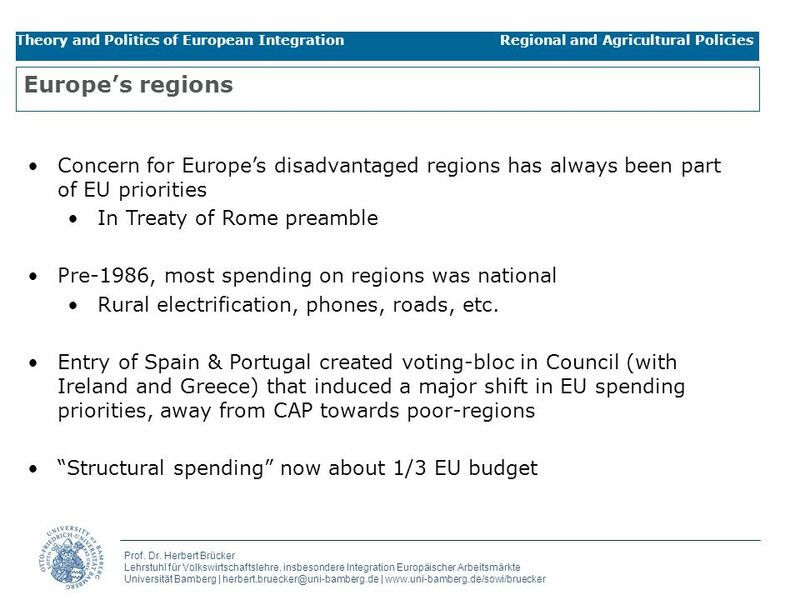 ·spending on basic infrastructure and production subsidies in less developed regions ·generally defined: regions with incomes less than 75% of the EU average –Nordic exceptions (low population density) ·There are about 50 “objective 1 regions”; they have about 20% of the EU population. 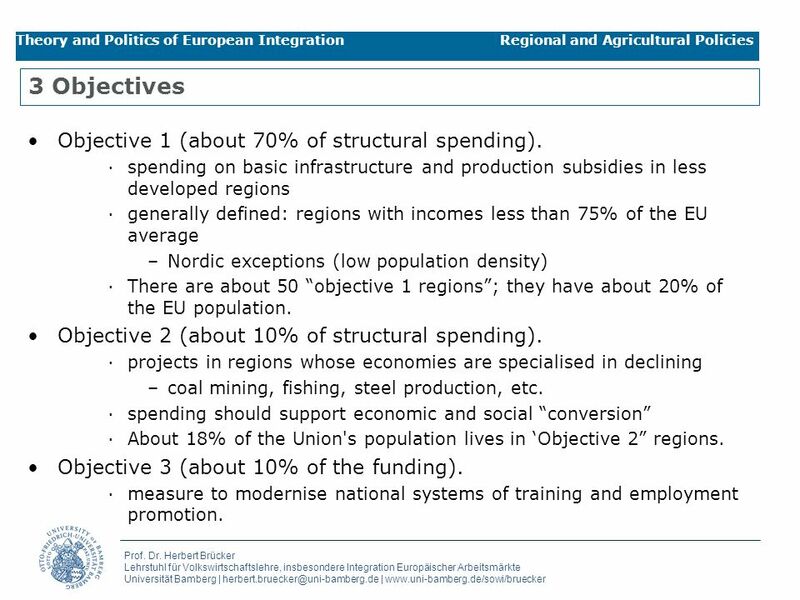 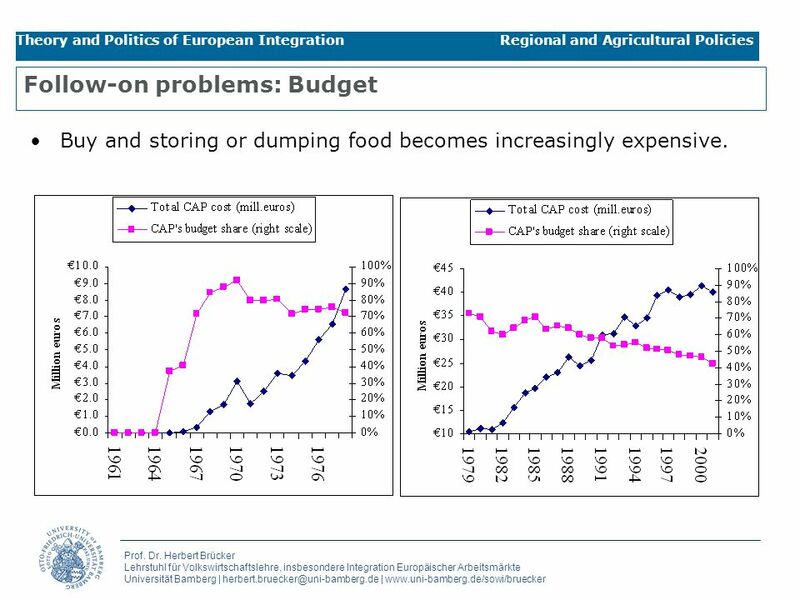 Objective 2 (about 10% of structural spending). 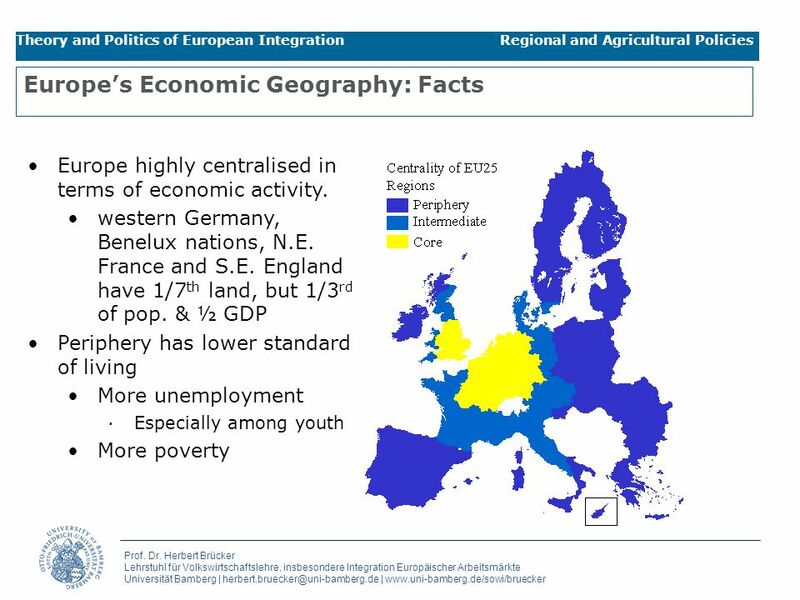 ·projects in regions whose economies are specialised in declining –coal mining, fishing, steel production, etc. 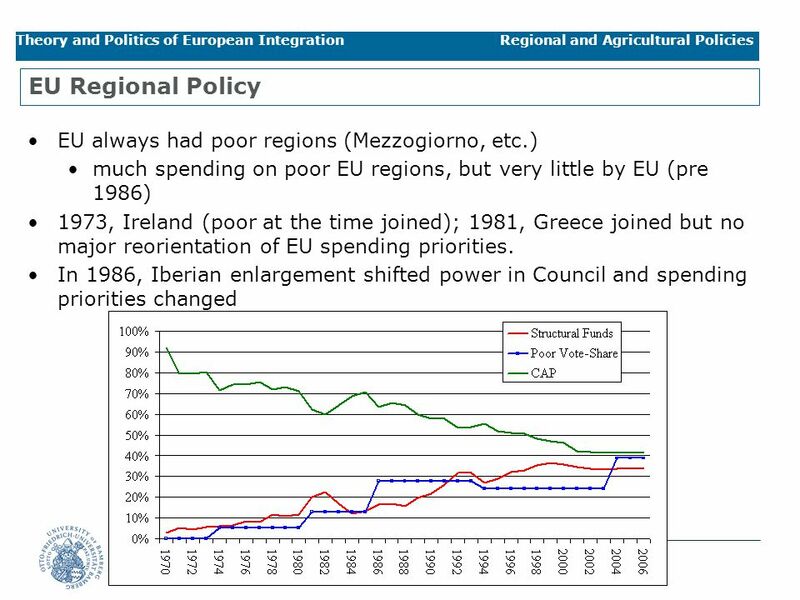 ·spending should support economic and social “conversion” ·About 18% of the Union's population lives in ‘Objective 2” regions. 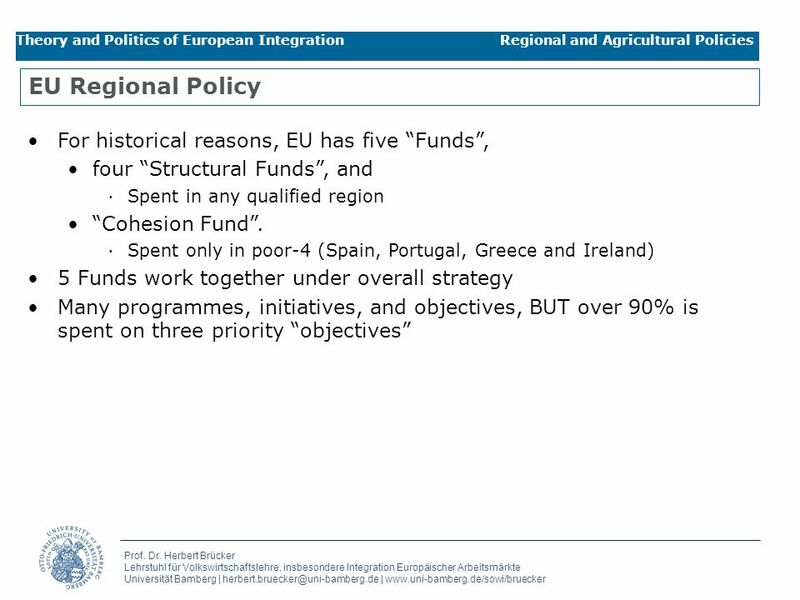 Objective 3 (about 10% of the funding). 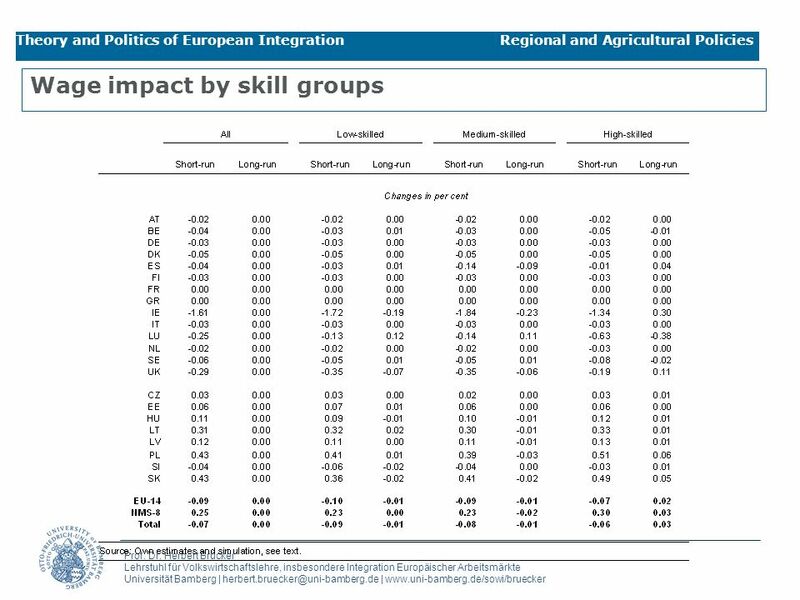 ·measure to modernise national systems of training and employment promotion. 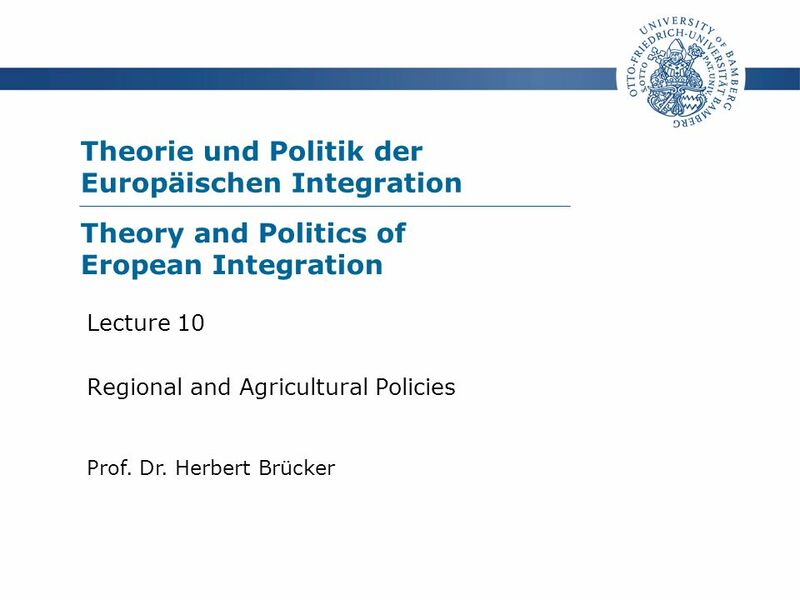 44 Prof. Dr. Herbert Brücker Lehrstuhl für Volkswirtschaftslehre, insbesondere Integration Europäischer Arbeitsmärkte Universität Bamberg | herbert.bruecker@uni-bamberg.de | www.uni-bamberg.de/sowi/bruecker Theory and Politics of European Integration Regional and Agricultural Policies Follow-on problems: Budget Buy and storing or dumping food becomes increasingly expensive. 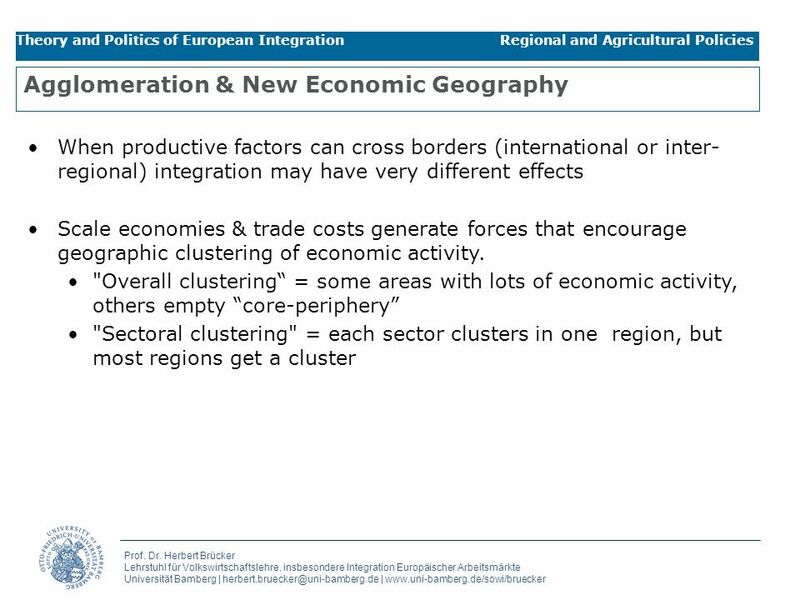 50 Prof. Dr. Herbert Brücker Lehrstuhl für Volkswirtschaftslehre, insbesondere Integration Europäischer Arbeitsmärkte Universität Bamberg | herbert.bruecker@uni-bamberg.de | www.uni-bamberg.de/sowi/bruecker Theory and Politics of European Integration Regional and Agricultural Policies Evaluation of the today’s CAP Supply problems & food “mountains” Left figure: massive shift to direct payments Price cut reduced EU buying of food: right figure shows important drop in EU storage of food EU dumping of food on world market also dropped. 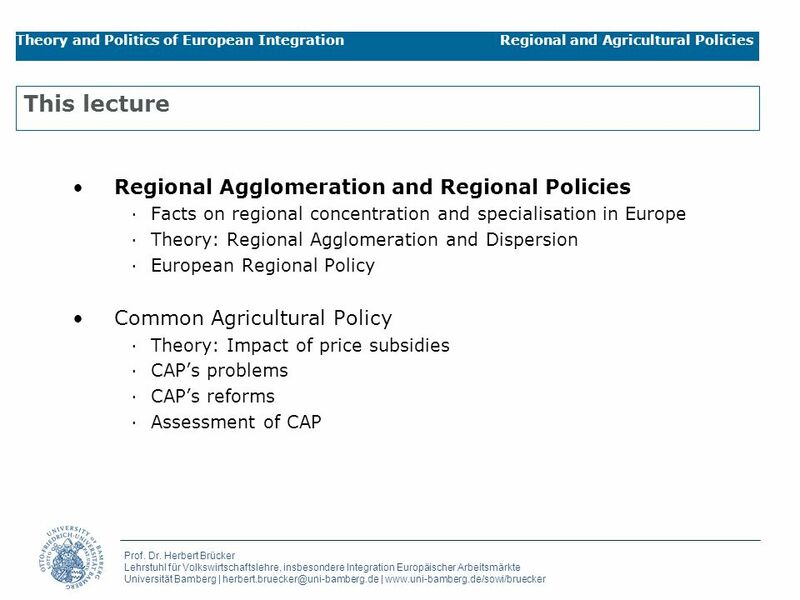 Herunterladen ppt "Theorie und Politik der Europäischen Integration Prof. Dr. Herbert Brücker Lecture 10 Regional and Agricultural Policies Theory and Politics of Eropean." 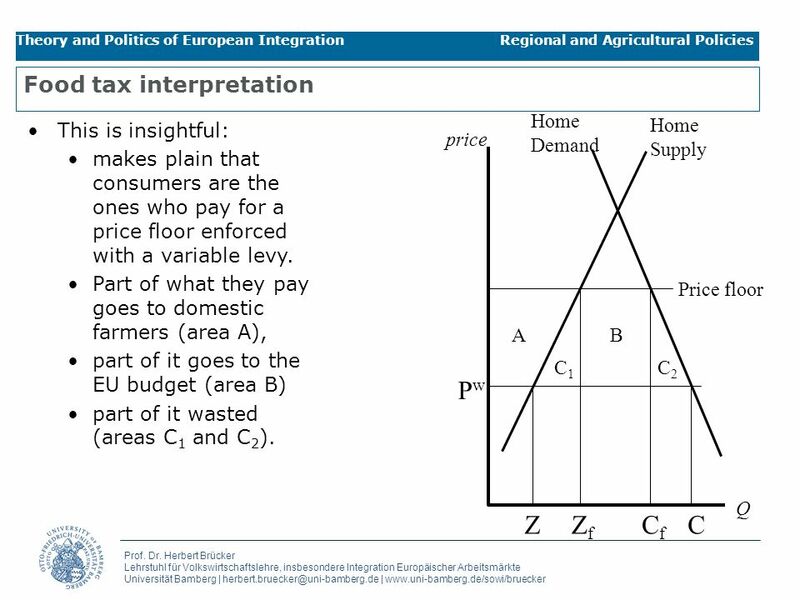 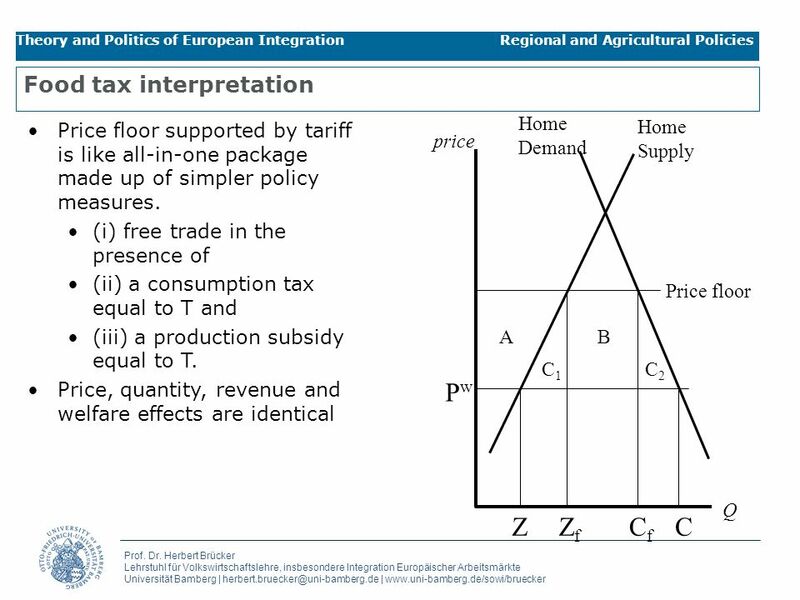 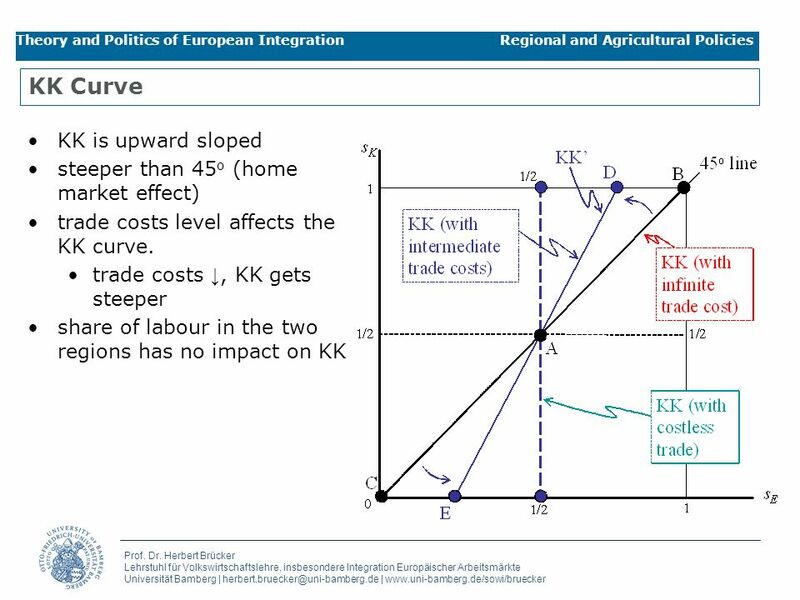 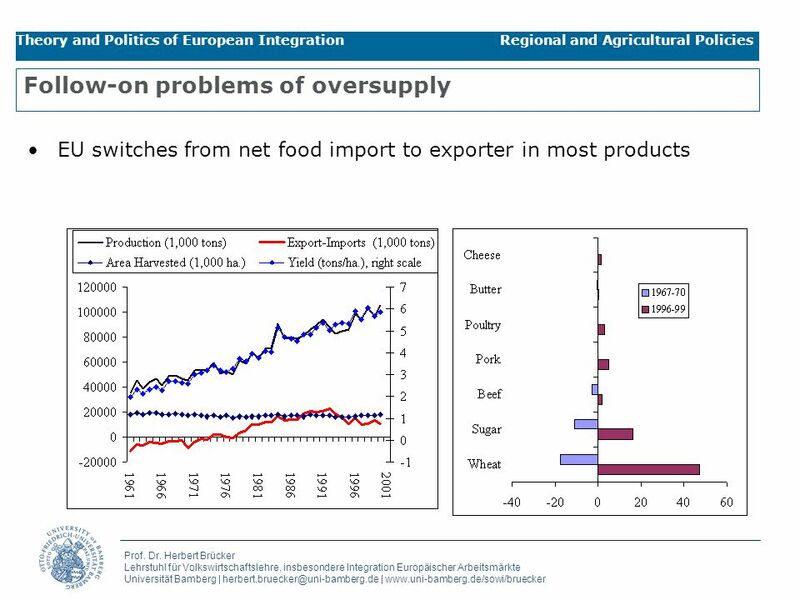 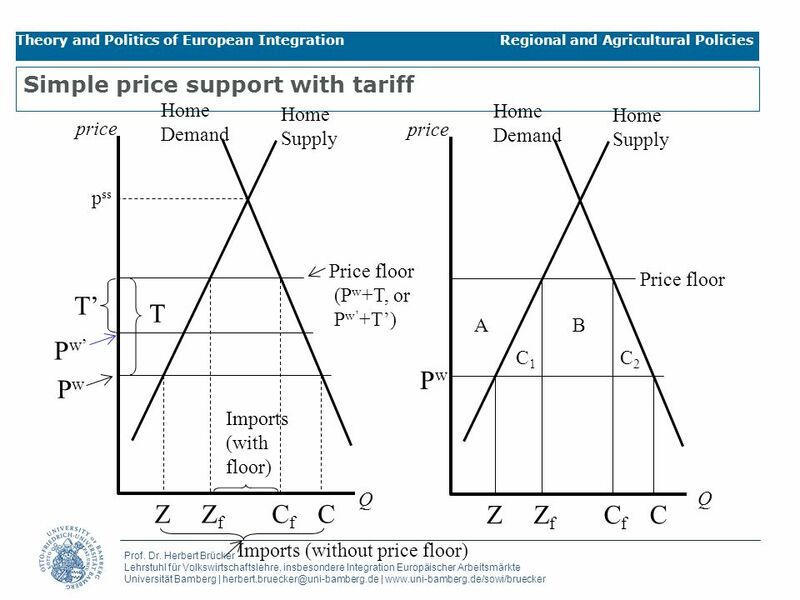 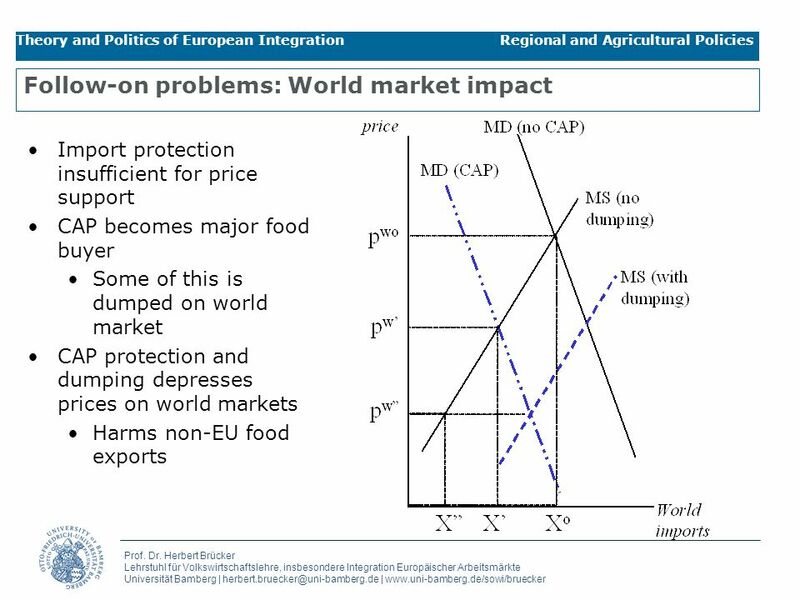 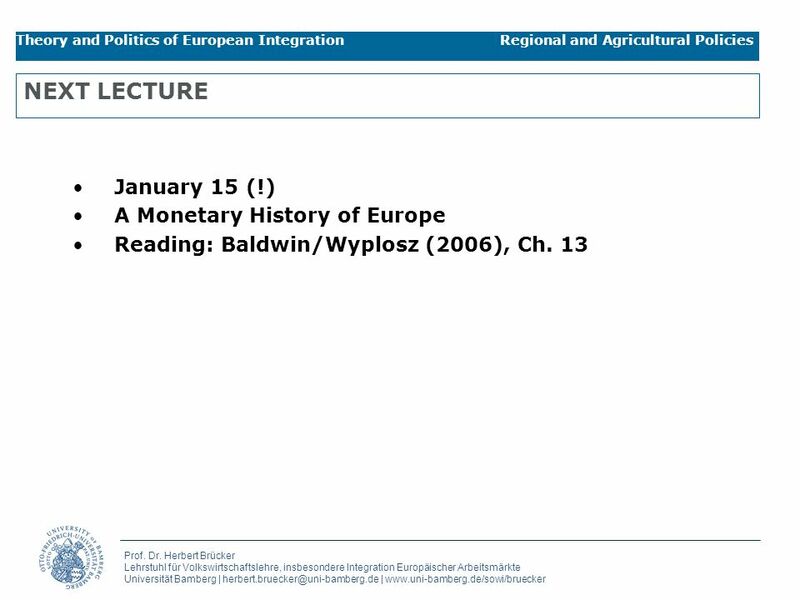 Theorie und Politik der Europäischen Integration Prof. Dr. Herbert Brücker Lecture 4 The Microeconomics of Trade and Tariffs Theory and Politics of European. 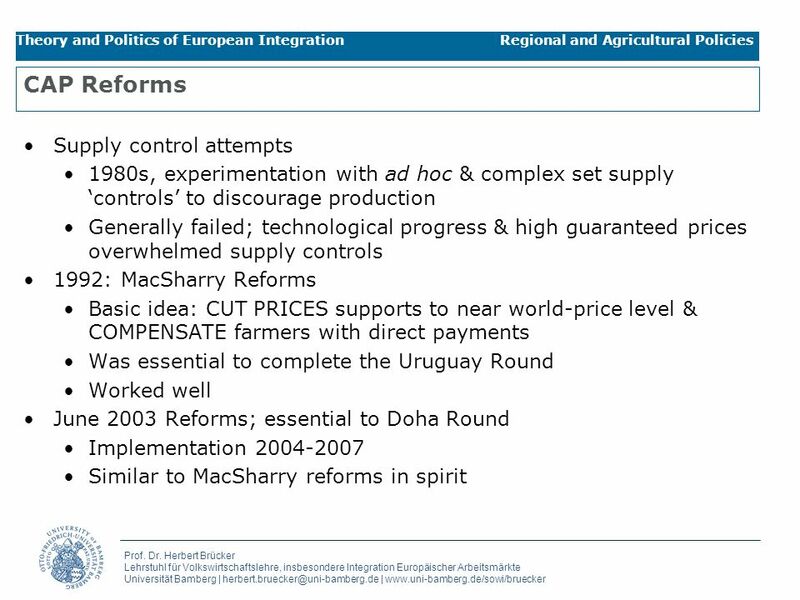 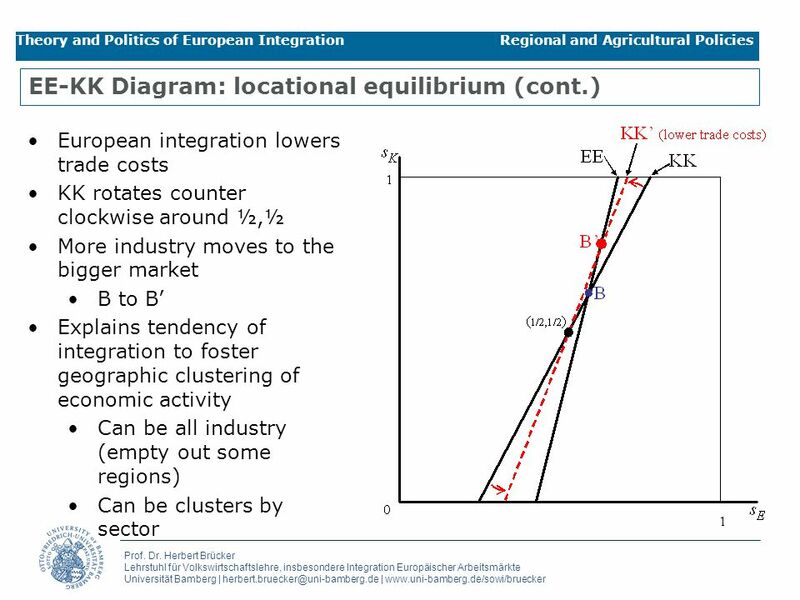 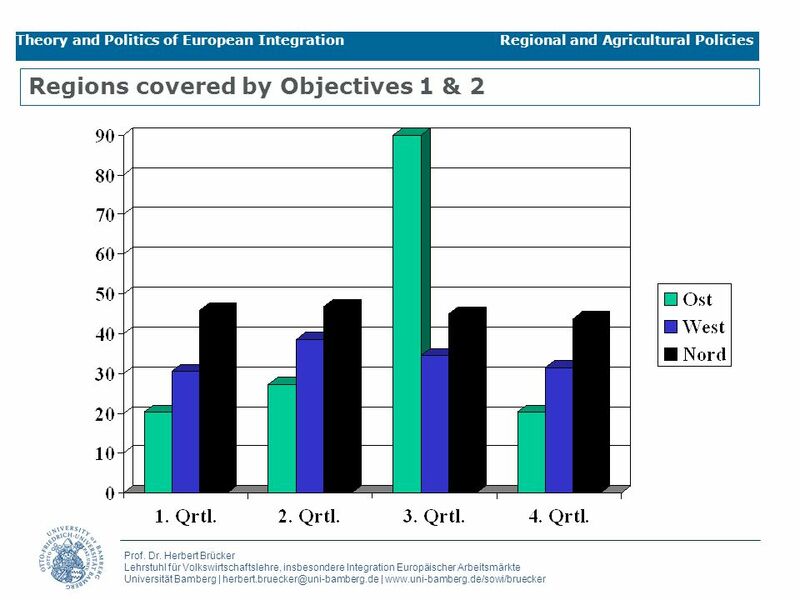 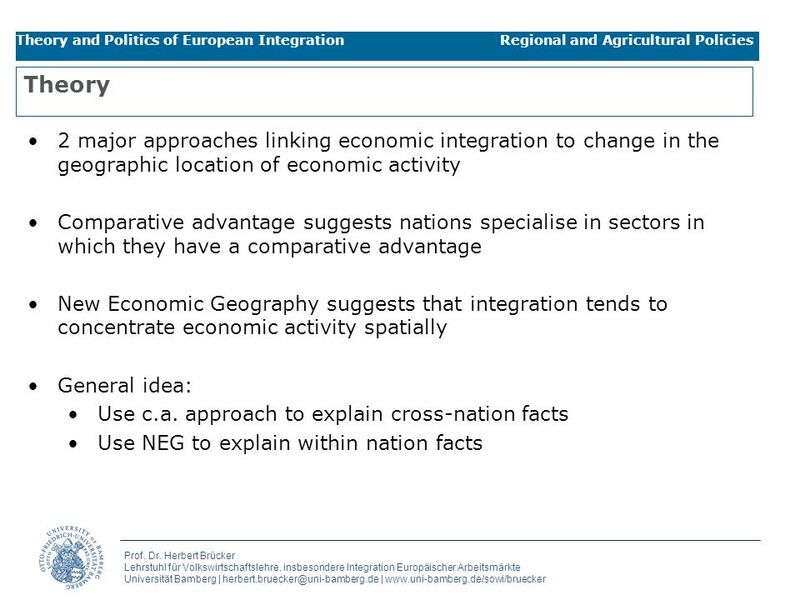 Theorie und Politik der Europäischen Integration Prof. Dr. Herbert Brücker Lecture 12 Optimum Currency Areas Theory and Politics of Eropean Integration. 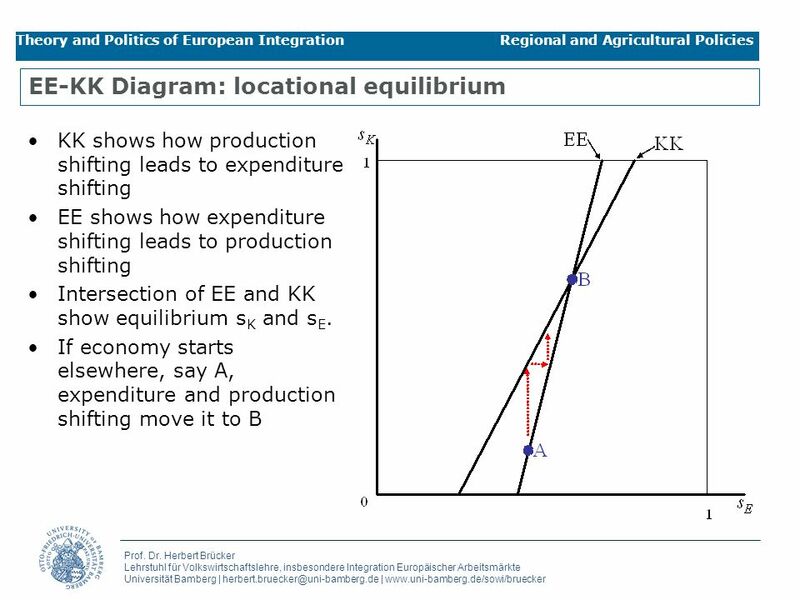 Theorie und Politik der Europäischen Integration Prof. Dr. Herbert Brücker Lecture 3 Decisionmaking Theory and Politics of European Integration. 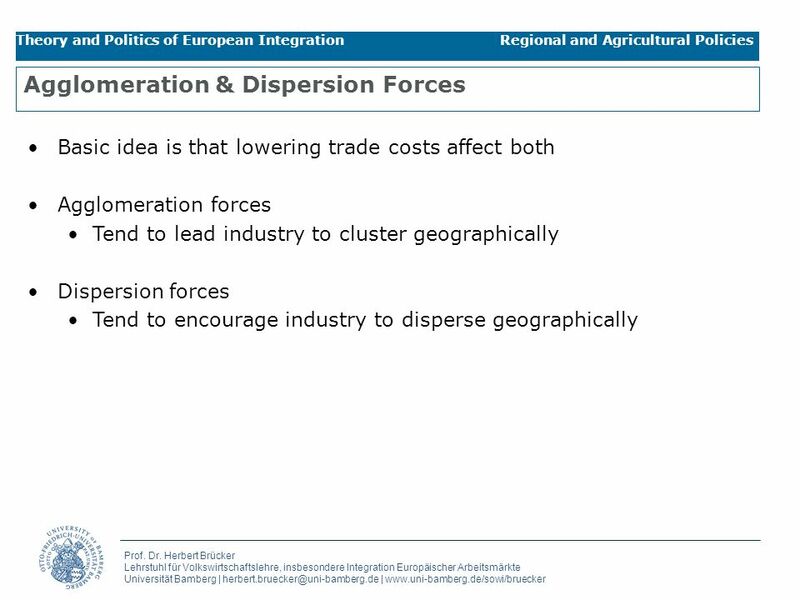 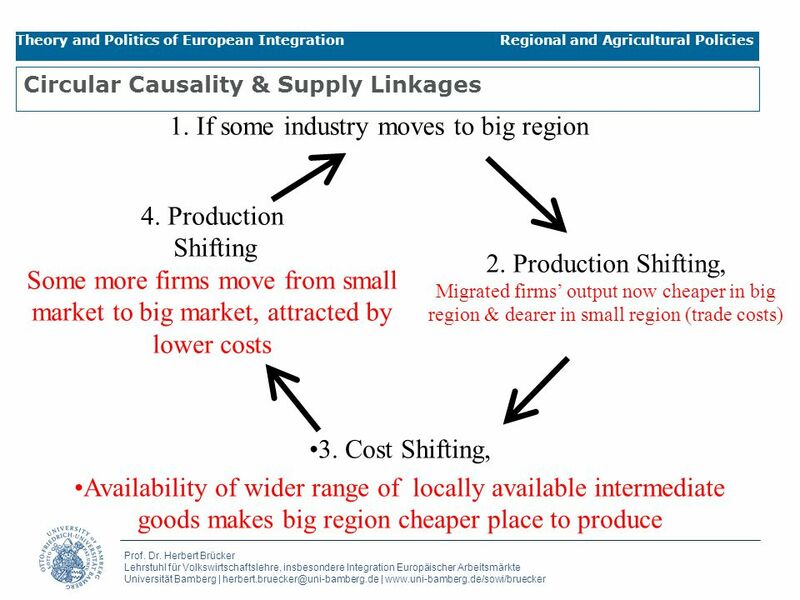 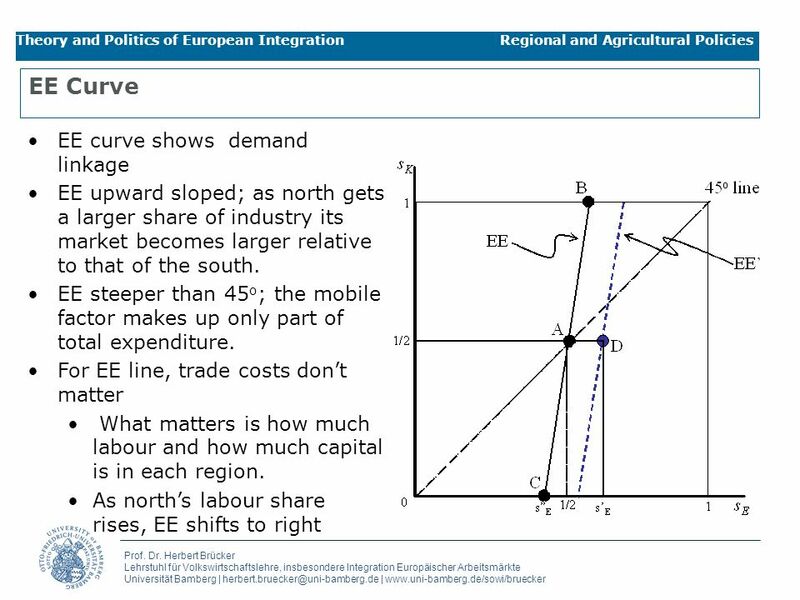 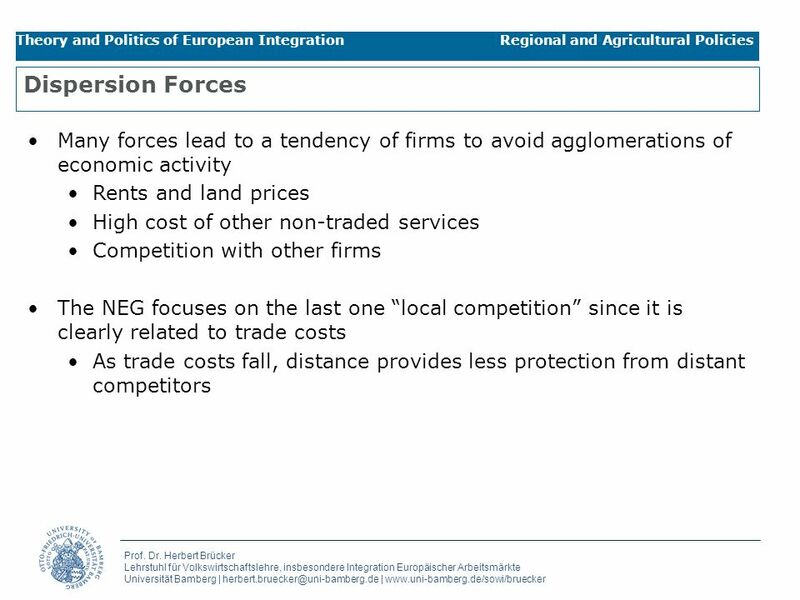 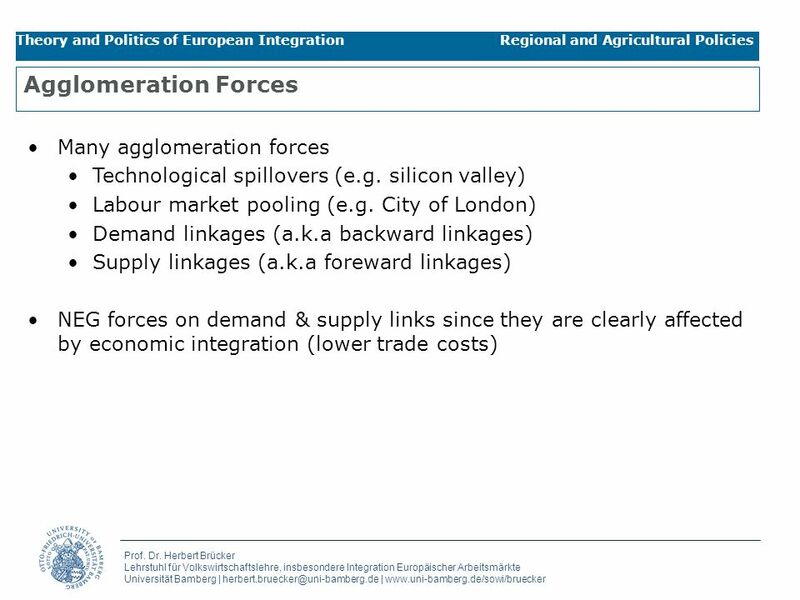 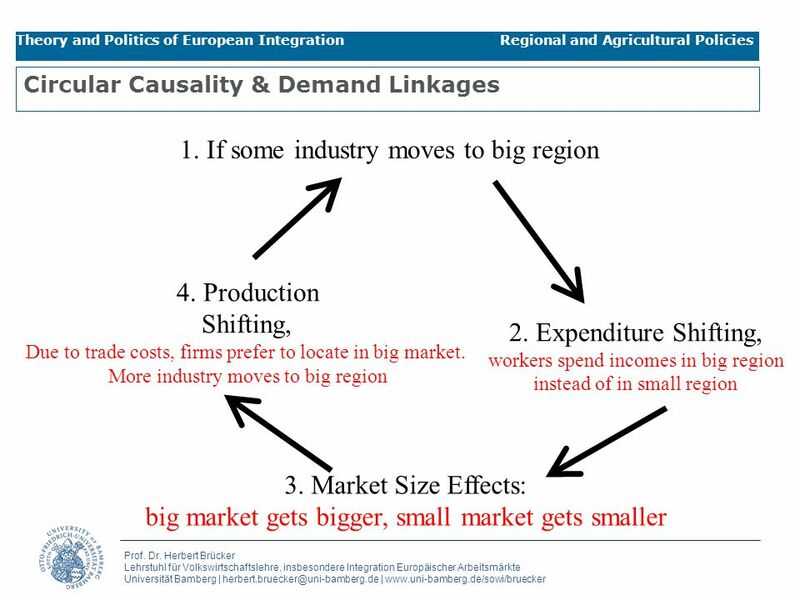 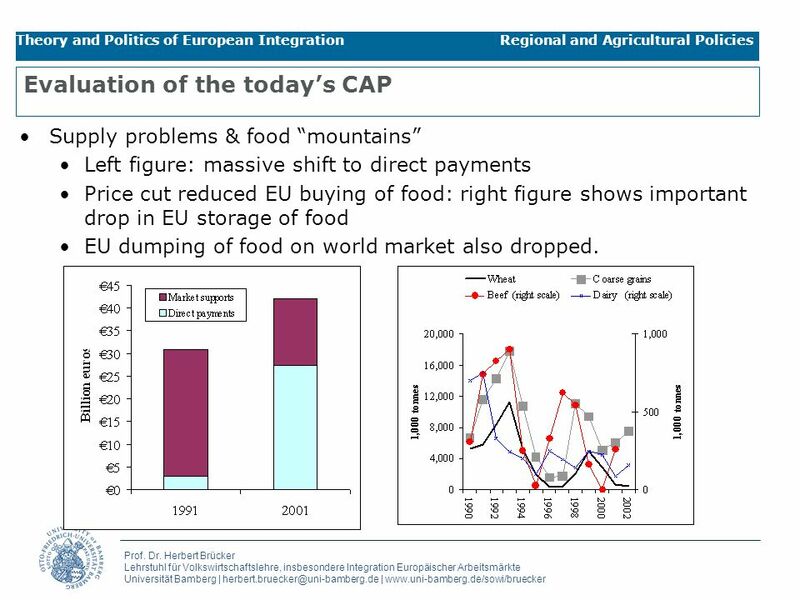 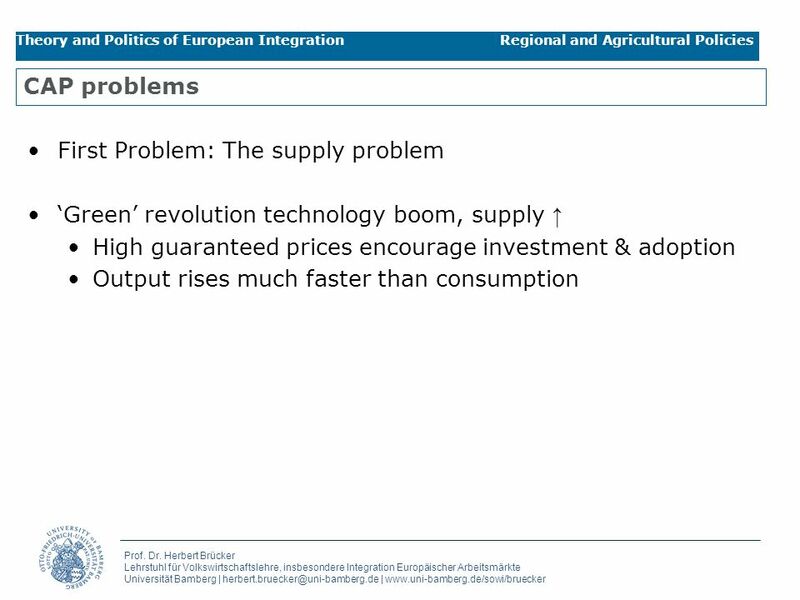 Theorie und Politik der Europäischen Integration Prof. Dr. Herbert Brücker Lecture 6 Market Size and Scale Effects Theory and Politics of European Integration.